You would expect to find some connections between a random selection of current exhibitions on in Melbourne. One would hope to make connections that reveal something of the zeitgeist. One exhibition could just be the idiosyncratic interests of an individual artist – I did not expect to see 9 artists in two different galleries working with plastic vegetation to be one of those connections. The plastic foliage, flowers and vegetables are the undead, the eternal zombie version of natural vegetation. I feel that I keep repeating, but the fact won’t go away, that plastic will last for thousands of years longer than the oil paintings that I saw. Beauty may be eternal but plastic lasts longer. At Craft Victoria eight local jewelers create “unnatural Acts” spectacularly curated by Lauren Simeoni and Melinda Young. The “unnatural Acts” are jewellery made from artificial plants. There are bell jars, petri dishes and other scientific looking equipment on a trestle table in the gallery. On the wall a spectrum of necklaces move from green to deep red. The unnatural media of plastic foliage was escaping into cracks in the whitewashed bricks on the gallery wall. And at Mailbox 141 Sarina Lirosi’s exhibition “Forevermore” each of the mailboxes contained a plastic flower taken from “the grave of people I knew.” The plastic flowers are daubed with varnish and sparkles to capture the light. It is not that plastic vegetation was the only connection that I saw on my visits to galleries this week – artists should not throw out their paints. There were some powerful exhibitions of paintings at fortyfivedownstairs, Flinders Lane Gallery and Arc. I enjoyed seeing Graeme Altmann’s exhibition “Coastal Boy” at Fortyfivedownstairs. Altmann’s paintings are good but his model boats are fantastic. These research and industrial boats are not beautiful; they are made from found materials, brass and metal parts. Pulleys, cranes, funnels and other equipment fill their decks and hang from their sides. They reminded my of Hieronymus Bosch’s ship of fools. Altmann’s oil paintings range from atmospheric to surreal costal landscapes; his painting “Before we got there” was a powerful image of light, water, rocks and space. Flinders Lane Gallery had the urban landscapes of Garry Pumfrey “Obres Noves” depicting Barcelona. The old city of Barcelona, like Melbourne, is known for its winding lane ways, back street bars and street art. Pumfrey’s paintings would be timeless except for the presence of graffiti, the pair of runners hanging on the telephone line. Arc One had “Fallen Light 2012” paintings by notable, Sydney-based artist Robert Owen is old school abstract painting but deals like all of the paintings in the optics of light and dark. The exhibition in Arc One looks like a hard edge geometric version of Rothko’s chapel. The series of paintings is connected, at least in title, to Owen’s work at the new Hamer Hall. I wonder how the individual paintings would look as the effect of the exhibition is created by the connections between the paintings. There is a Lynchian style to the paintings of Dianne Gall. It is a surreal film noir quality mixed with meticulous chosen design elements. Lush elements of American art deco or classic designs from the 1950s create a serene surface that suggests a dark, mysterious underneath. Femme Noir at the Catherine Asquith Gallery is the exhibition of figurative oil paintings by Adelaide based artist, Dianne Gall. This is Gall’s first solo exhibition in Melbourne although she has been exhibiting in Adelaide and Canberra for years. Many of Gall’s paintings remind me of David Lynch’s 2001 film, Mulholland Drive. Not that the images are from the film or even America, Gall has found locations and local fashions designers in Adelaide with the right ambience. Her earlier paintings on exhibition reminded me of film stills, their muted, almost monochrome, palette suggesting classic film noir images, but the more recent paintings in the exhibition are definitely Lynchian. What is about these images that makes them Lynchian, mysterious and surreal? Disconnection seems to be the key. In one of Gall’s paintings, Disconnection, 2012, we see the back of a woman through a doorway looking at a painting in a room with geometric wallpaper. There have been a lot of “disconnects”, to use the newspeak of the US Army, in the international modern lifestyle. The modern world is disconnected from both time and place; it is international and atemporal, like an airport lounge bar. There is a disconnection between the material reality and the existential – who are these mysterious women in Gall’s paintings and Lynch’s movies? It is the second time this week that I have been reminded of David Lynch. William Forsythe used the opening scene from Inland Empire (2006) as part of the text for his dance piece, I Don’t Believe In Outer Space. There were many disconnections in his dance piece, the dancers each doing their own thing with an electronic soundtrack and verbal soundtrack going in other directions. Gallery Smith and Purgatory Artspace occupy the same old brick warehouse on Abbotsford St. in North Melbourne. Gallery Smith is a large commercial gallery with two exhibition spaces and “the lounge” with a selection from their stock room. Upstairs in the loft the “project space’ of Purgatory Artspace is more Spartan affair, a minimal white cube space. While I was in North Melbourne I also stopped by No No Gallery but it was closed before an exhibition opening that night. At Gallery Smith the British-born Brisbane-based artist, Ian Friend was exhibiting a series of oil paintings in the main Gallery 1. I sat on the comfortable white lounge in the gallery enjoying the calm ambience of the paintings. Friend’s cool, pale paintings are inspired by the poetry of English poet Edward Thomas (1878-1917) and the English landscape of the Southern chalk downs. Yellow, blue and grey dots float on a background of pale bands. One of the paintings, “Here love ends” provided a counterpoint to the series with a darker background, slightly rougher brush strokes and red tones. In Gallery 2 Valerie Sparks has a series of color photographs of taxidermy birds: “Little Bird, Big History”. The stuffed birds looked old but not as old as they actually were: they had been collected in the mid 18th century. The Yellow Tail Black Cockatoo was collected on Matthew Flinders’s second voyage to Australia. There were also some Eric Brigeman’s photographs stacked near the entrance of Gallery Smith; I recognized his work from last year’s Basil Sellers Art Prize exhibition. 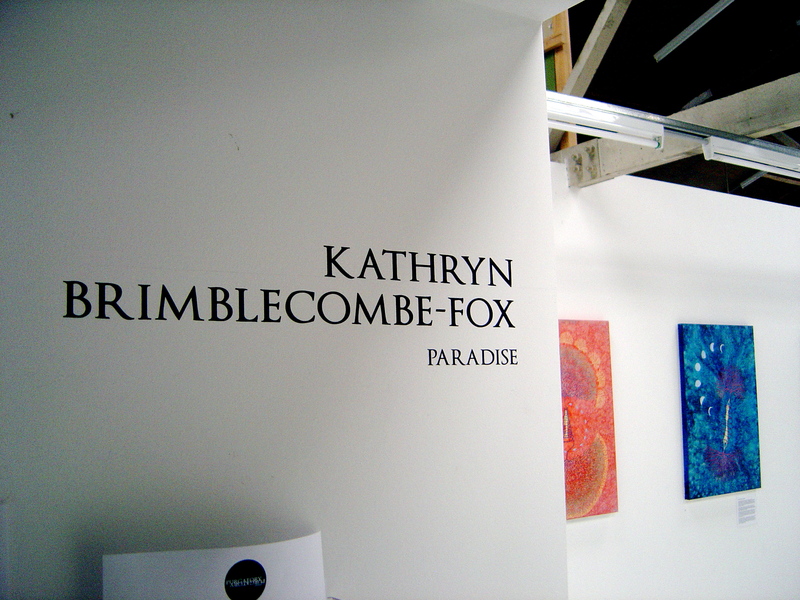 Upstairs at Purgatory Artspace there was a remarkable exhibition of 3D painting by another Brisbane-based artist, Kathryn Brimblecombe-Fox’s “Paradise”. I have never viewed a whole exhibition of paintings through polarized glasses. The paintings are not some purely technical exercise in creating 3D effects – the artist only discovered that her paintings worked this way by accident rather than design. The 3D effects are not mind blowing but very effective in their own right as parts of the paintings appear to float a centimeter above the background. Were it not for the 3D effects the mystical cosmic subjects of these paintings would have been a bit ordinary and superficial. There aren’t many galleries in North Melbourne but there are more than there were only 5 years ago. I predict that there will be more in the near future as there are plenty of warehouses to convert in the area. I have just got back to Melbourne after spending a few days Brisbane. Most of the commercial galleries in Brisbane are located in Fortitude Valley and most of the galleries in Fortitude Valley are located along Brunswick Street (Australia has such a repetitive way of naming streets). “The Valley”, as it is known in Brisvegas, is a mix of strip clubs, pubs, clubs, restaurants and cafés. There is a small pedestrian mall with al fresco dinning occupying most of the space. There is a lot of street art in the area, mostly stickers on the back of every street sign, generally by Loki One, Mizcry or ZKLR. This was not the first time that I have been to the galleries in Fortitude Valley however this time when I visited many were closed. It must have been the wrong time of the month; they were hanging exhibitions in Gallery 2120 and Jugglers. A lot of decorative leather masks were being taken into Gallery 2120 so I probably didn’t want to see it anyway (there are a few other ceramic and glass galleries around but I wasn’t interested). I was interested in Jugglers, and disappointed that it wasn’t open, as I had seen two of their murals along the train line on my way to the Valley. Libby Edwards Gallery looked like it had been gutted for some major renovations. I don’t know why the Fort Arts Hub was closed, but again I was disappointed, it had some street influenced art in the window. Jan Murphy Gallery and Philip Bacon Galleries were open; they are in the same building. Philip Bacon was showing an exhibition of Ray Crooke island scenes, bland South Pacific scenes with a flat thin paint, and their stock paintings including works by Donald Friend, Brett Whitely, and Roy DeMeister. Philip Bacon Galleries also had a selection of ordinary but expensive jewellery. Jan Murphy Gallery had an exhibition of David Band paintings. Band’s abstract forms and abstracted still life are cool but a bit formulaic and passé. The colours and shapes are attractive but unexciting. Finally in Heiser Gallery I see something worth taking a second look. Heiser Gallery a small commercial gallery further down Arthur St. from Philip Bacon Galleries. It was showing Inside Out, an exhibition of oil paintings of rooms by Kristin Headlam. These cool interior scenes are thinly painted, almost a sketch in oils. The atmosphere in these rooms that Headlam creates with confident brushstrokes is palpable. In some paintings the rooms are empty in others there are figures. There is even a history painting, “Handover” depicting the meeting in the Lodge between Mr and Mrs Rudd and Mr and Mrs Howard after the election. The best of the exhibitions in Fortitude Valley that I saw were at IMA (Institute of Modern Art) – I will be writing a whole blog entry about the parochial use of term “modern art” in Brisbane. At IMA there was The Declaration of Resemblance and Fluid Insurgents by Jemima Wyman. Her intense photo-collages, video and fabric creations of patterned textiles, featured the ubiquitous plaid shirt. This pattern combined with black ski masks that are decorated with false eyes and toothy mouths, conjured images of a lost tribe of urban fringe dwellers. Also at IMA was Taryn Simon’s photojournalism exhibition An American Index of the Hidden and Unfamiliar taken between 2002 and 2007 was a different look at America. There were some of the now familiar images of hidden America, the body farm in Tennessee, Klansmen and death row, but there were also some unfamiliar sights, the piles of stuff removed by quarantine at JFK airport. The commercial art scene in Brisbane’s Fortitude Valley does not appear very strong and the decorative arts are the major part of that art market.